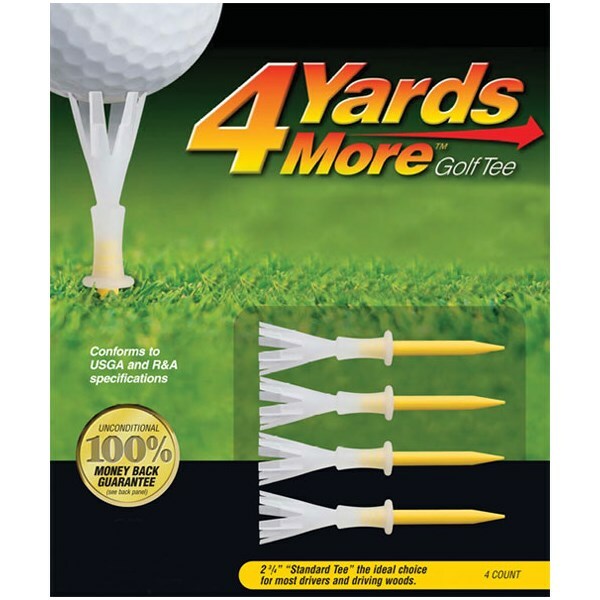 These tees set the ball up nicely and give the feeling that you can sweep the club right through. They give you that little bit more confidence standing over the ball. Also if you struggle to find the tee after your shot this won't be a problem as the tee does not come out of the ground. I am use these already several years. Are guaranteed genuine just to me and to others. 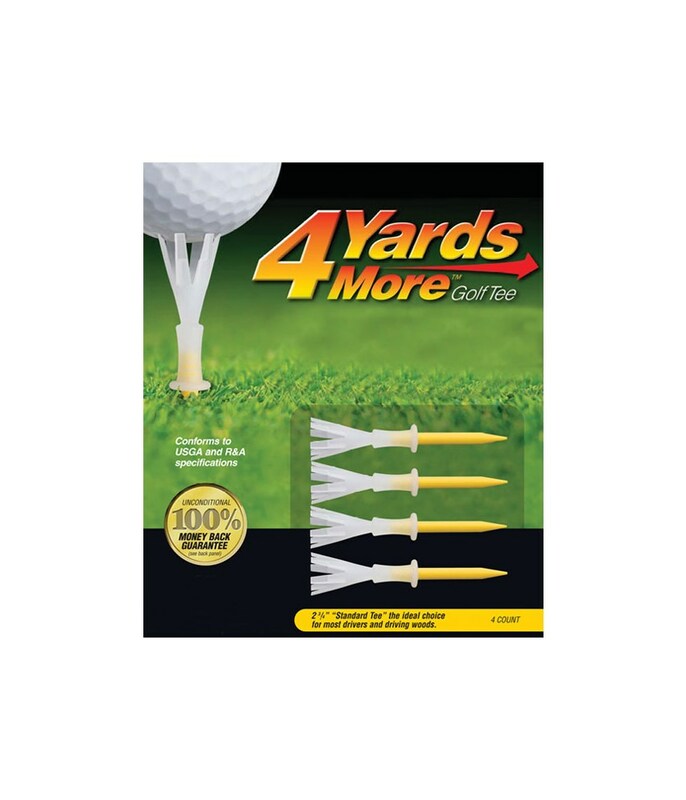 I am not sure if it gives you 4 yards , but it seems that the distance is longer from the tee. Not suitable for the hard ground on the tee. A little expensive but I still did not lose or break one yet, just bought the yellow to compare with the blue ones. Very good product and happy they are back in stock. As well do not leave any marks on the driver like a white wooden tee. I started using them around 2007-8 when I got the blue ones as a gift. I can say that my drives did get longer, but I can't quite say whether it's because of the tees or if it's because I've improved via practice. I can tell you that because I'm teeing up the ball at a consistent height, it became just one less thing on my mind at setup. Also, I almost never lose my tees now. Something about paying for four tees a pop, probably, but still, at least I don't have to carry a bag of tees or worry about running out on the course. Not used them on the course yet but they seem to sit nicely. 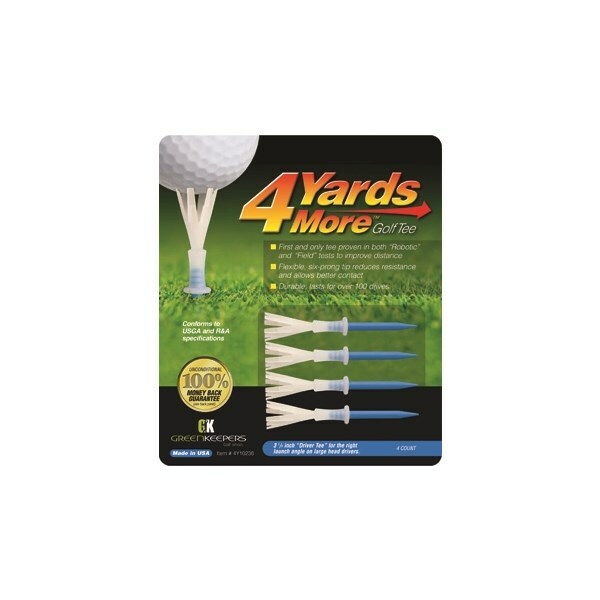 Quite expensive for four tees but if they work well and don't break then they're good value for money. 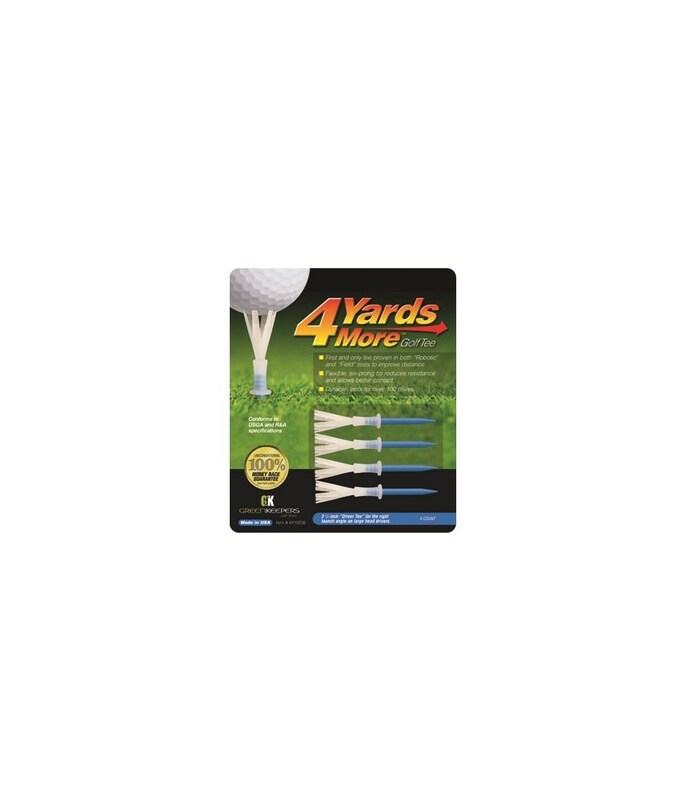 I am geting another 5-10 yards I would definitely recommend. I am also geting much more control when hiting a draw or fade and is just an over all good tee. 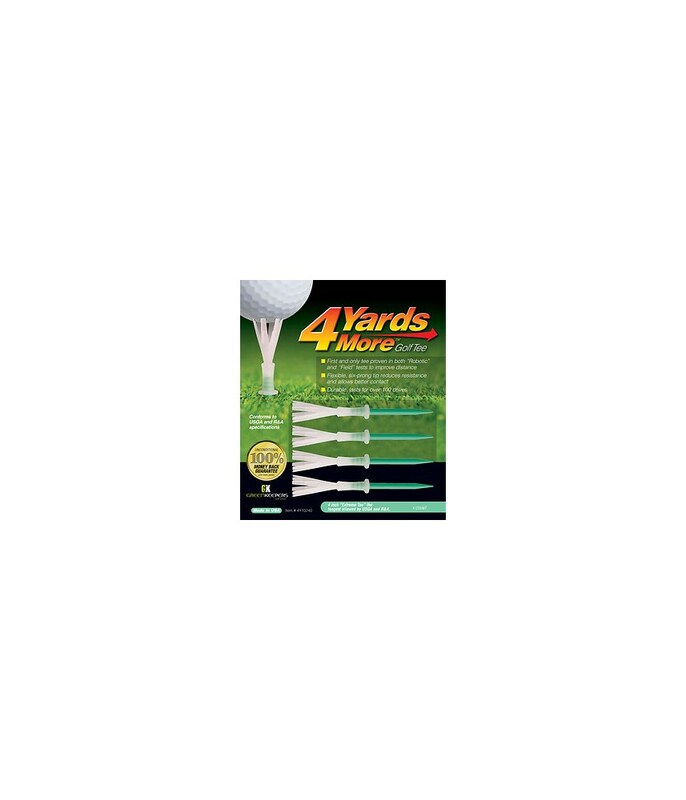 Have used the 31/4" tees and they are great, but how do I order the 23/4 Height tees? They dont appear on the web site order form. I may have missed them. I find that i am striking the ball too high on the clubface. First & only tee proven in both "Robotic" & "Field" tests to improve distance. Flexible, six-prong tip reduces resistance & allows better contact. Durable, lasts for over 100 drives. 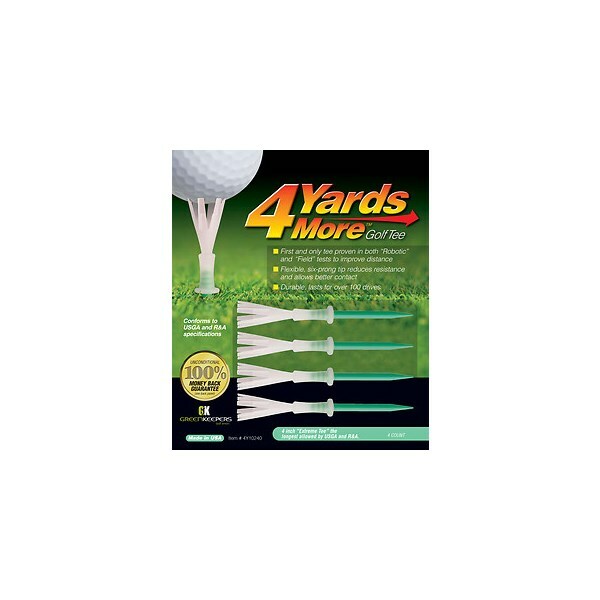 4 Yards More” Golf Tee is a reusable golf tee that will add more yards to your driving distance. The tee is designed with a rigid polymer stake and a dynamic elastomer crown. The body and individual fingers of the crown flex with the force of the drive to reduce resistance at impact. The ball launches off the tee with less friction and low ball spin resulting in longer, straighter drives. Tournament play legal, conforms to USGA and R&A regulations.